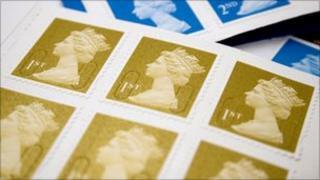 A law is set to be passed guaranteeing that UK stamps will continue to feature the Queen's head - even if Royal Mail enters foreign hands. At present, there is no legal obligation to show the monarch's image, although Royal Mail has always done so. Postal Affairs Minister Ed Davey said any potential buyer would have to be "mad" to drop it, but the new law would provide a "safeguard" just in case. German and Dutch operators are expected to be leading bidders in the sell-off. Mr Davey held talks with Buckingham Palace after learning that draft legislation, paving the way for a sell-off, would give the Queen a veto over any use of her image but would not insist her head be shown. Now it has emerged that amendments to the Postal Services Bill will be put forward next week to close that potential loophole. Mr Davey told the Mail on Sunday: "After listening to views of members of both Houses of Parliament and the palace, we have agreed this additional safeguard." The newspaper had previously claimed there was "anger" at the Palace over the situation, but Mr Davey said his department and royal officials had "worked extremely well together to prepare for this initiative". Labour had accused the government of being deliberately vague in the draft legislation, suggesting that "the fewer strings they attach, the more money they will get from a foreign buyer". Meanwhile, trade unionists and other protesters have been demonstrating in Prime Minister David Cameron's constituency in Witney, Oxfordshire against the plans to part-privatise Royal Mail. Billy Hayes, general secretary of the Communication Workers Union said: "Government cuts are really beginning to draw blood now as jobs and services suffer. "The planned privatisation of Royal Mail is an unnecessary ideological move which will damage postal services forever." The Postal Services Bill, which is back in the Commons on Wednesday, provides for the privatisation of Royal Mail - apart from Post Offices Ltd - and the transfer of its pension liabilities to the government.